My husband and I stayed at the Holiday Travel Park in July 2006. We decided to camp instead of stay at a hotel for two reasons: one, it was less expensive; and two, my husband loves camping and wanted me to try it. We had booked our reservations online and there were no problems with checking in. We were directed to our camp site and had no problems seting up camp. The site was very peaceful, even though there were many guests at the park. It was in a nicely wooded area and provided some much needed serenity (after all, isn’t that what vacation is for?). The Holiday Travel Park featured 4 different swimming pools, very clean facilities, a quirky little general store, and a great atmosphere. 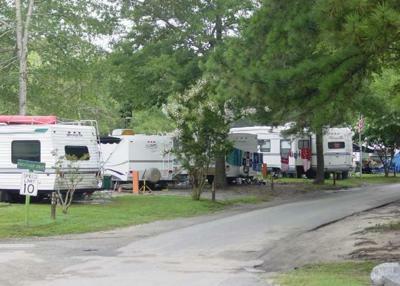 There was even a special parking lot across from the beach for campers only, which was very convenient. We stayed at the Park for a total of three nights, but due to unforeseeable circumstances, we were forced to leave one day earlier than we had originally booked. To our surprise, we were actually refunded the amount for the fourth night. If I were to vacation in Virginia Beach again, I would definitely stay at the Holiday Trav-L Park. Even though you have to drive or bike to the beach, the peacefulness of the campground and quality of service is definitely worth it. And hey, where else can you get your picture taken with a rainbow colored zebra statue? just got back from a wonderful weeks vac @ holiday trav-l-park always a great time (i love jet noise)kids had a great time seen friends there also made new friends we come here every year & love it never any complaints I give Holiday park 5 stars!! Our family loves this campground. There is something for all the ages of our children. The bands at the pool each night are wonderful and it is all included in the price. The bathrooms are very very clean and that is important to our family. Bingo every night if you want. The parking lot for campers does fill up early so be sure to get there early if you want the free parking spaces but it will save you a lot of money. The jets overhead are loud at times but our boys love watching them but they can be loud. We love it here! We always book our week when we are there as it fills up very quickly. A+ rating from our family. I hear that it is on the fligt path with the naval air station and that it is very noisy air traffic. Is this true. I have small dogs that freak out at thunder. They also have a trolly that takes you to the beach so you don't have to drive.We used to camp here when our son was little and this was my favorite campground. They have live bands on the week-ends and bingo.Great place to camp even if you don't like the beach.Check it out.